Hi, and welcome to my Home Page. You are visitor number since I started this page on October 1st, 1996. My interests are Calligraphy ( 22nd December, 1997), PC Sound and MIDI (though I have no special equipment beyond a 16-bit SoundBlaster), and computer games( 10th November, 1999). I am also developing a passion for Ray-tracing, but my website space is limited, so I probably won't be able to show any of my images (that's my excuse - anyway! 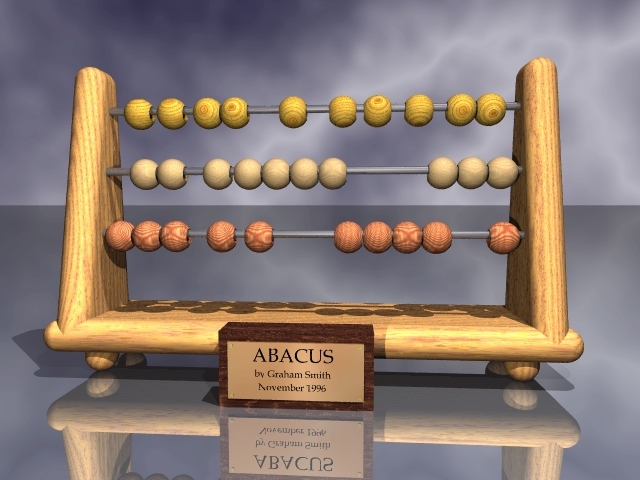 ), but just as a taster, here is one that I did (not so) recently - (Abacus 640x480x256 - Nov 96). I am a dedicated collecter of freebies, and this principal has been used exclusively in building this site. Have a look at my Freebies Page ( 24th June, 1998). I am also what the Insurance company termed a 'Born again biker', and have just returned to a bike after a 13 year absence. Bikers among you (and the rest if you want to!) can visit my Bikes Page ( May, 2000). 23rd Dec, 97 - I have finally set myself up a 'personal' e-mail account using HotMail, and have just added the link to all my pages. Please feel free to use it, although messages won't be checked daily (so don't be dissappointed if I don't respond immediately!). I have also added a link that will allow you to sign up with this great FREE service. My homepage has become pretty stable now, and I am not actively changing it, except to add intro's to new pages, etc., but please bookmark me, and come again soon, 'coz my other pages are under continuous review (time and work permitting), and will grow. Look out for the and flags. You can e-mail me courtesy of HotMail if you like.